Hale S. Irwin is an American professional golfer. He is one of the few players in history to have won three U.S. Opens and was one of the world's leading golfers for much of the 1970s and 1980s. He has also developed a career as a golf course architect. Irwin played football at Boulder High School in Colorado, then enrolled at the University of Colorado-also in Boulder-and was starting quarterback his sophomore year. Though Irwin stood only six feet tall and weighed 175 pounds, he switched to defensive back. Irwin told Golf Magazine' s Curt Sampson that he preferred defense because he liked to be "on top of the pile looking like a hero" instead of "on the bottom of the pile getting the hell kicked out of me." Irwin was voted All-Big Eight free safety in both his junior and senior years. He also excelled at golf, winning the 1967 National Collegiate Athletic Association (NCAA) individual golf championship. The demands of both sports required intense dedication. Most days, Irwin left football practice and headed to the tee to hit a few hundred balls. After graduating with a marketing degree in 1968, Irwin decided he was too small to continue with football. 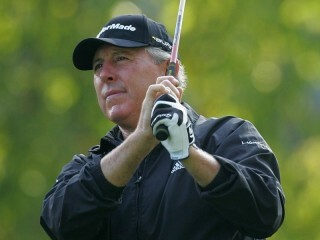 Irwin committed himself to a comeback and in 1990 won the U.S. Open-a tournament he had not won in eleven years. Irwin was usually calm and collected after his victories, but this time, he celebrated with a high-five lap around the green. At 45, he was the oldest player to win a U.S. Open. Two days later, he arrived at the Buick Classic and won again. Irwin considers these victories some of his sweetest.